Last week, I brought the tale of the Jaguar XJ to your Oppo feeds, a car that has cemented itself in history as possibly one of the most famous and loved Jaguars ever built, maybe second only to the gorgeous E-Type. But while researching the 50 year life of the XJ, I thought often of one of Jaguar’s models that doesn’t seem to get the same recognition and admiration as the XJ or even the modern F-Type: The XK. The XK has always been one of my personal favorite Jaguars, it’s always encapsulated what I thought to be quintessential English beauty, more than most Aston Martins could manage. Yet, it seems to mostly be forgotten or brushed off by many these days, which saddens me. So, in the hopes of changing that, I’m going to teach you all about what could be the last Jaguar grand-touring coupe ever built, and try to make you all love it in the process. One of many F-Type prototypes, this one bearing the most resemblance to the production X100 chassis XK. To properly begin the tale of the XK, you have to go back to the 1960s, when Jaguar had just introduced the famous E-Type into showrooms. The car had caused a wave like no other...it was gorgeous, a blast to drive, and imprinted itself into history as one of the most groundbreaking cars of all time. The E-Type, with help from Jaguar’s racing heritage, helped cement the brand into what it mostly became known for into today: luxury mixed with performance in a perfect balance. Jaguar knew how important the E-Type was to the automotive world, let alone how important it was to themselves, so they always knew they had to bring about a proper successor to the throne. Their first attempt was the XJS in 1975, which was a solid seller, but never quite captured the same essence of the E-Type that made it so popular. Jaguar knew this, and they sought to immediately remedy that issue starting in the 1980s with Project XJ41. A retired Sir William Lyons investigates one of the early XJ41 prototypes in 1984, giving his approval. The idea for the XJ41 was simple: make a convincing successor for the E-Type, which would be dubbed F-Type accordingly. It had to be as striking as its predecessor, with mind-blowing technology to make it just as spectacular as well, but for the modern age. But most importantly, it had to be unmistakably a Jaguar. Many mock-ups and prototypes were made, some with AWD, others with turbos, and basic suspension components were drawn up. Jaguar’s parent company at the time, British Leyland, were all for the project, and things seemed to be moving quickly towards eventual production. But, as the decade waned, many began to question Jaguar’s motives to building the car, as many production ready models had been shown off, but none had been given the green light. Jaguar just wanted to finish out every single detail of the prototypes they had built for they knew that anything lesser would be seen as a downfall just as the XJS had been. Jaguar hired Karmann and other coachbuilders to create some final prototypes for a 1995 launch, and as the decade was ready to end, things were finalizing in the F-Type’s planning. An early 90s design mockup, penned by Ian Callum for Ford. By this time, it bared more resemblance to another British GT from the 90s. However, plans were put indefinitely on hold in 1989, when Ford bought out Jaguar. They saw the F-Type plans as a huge waste of time and money that was going basically nowhere, and thought more interest should be taken in their saloon line. Ford instead placed the XJ41 and F-Type plans towards another British manufacturer, Aston Martin, with their plans to make a more lower-cost car in the range, which became the DB7 in 1994. When the XK was finally shown to the public in 1996, it was very much different than the XJ41/F-Type prototypes that it was birthed from. It was no longer a technological marvel as Jaguar had hoped it would be, with the final product sourcing its suspension components from the XJ40 saloon, and even some bits borrowed from its predecessor, the XJS. At first glance, you could consider it a letdown in comparison, but Jaguar made do with what they were given from Ford, and for the most part, everyone who drove one loved it. Jeremy Clarkson’s review on the X100. Excuse the ‘fro. The XK8 was the first to be unveiled, showcasing off the new, sleek design, featuring an E-Type style grille and cat-like headlamps, a power bulge on the hood, and a sleek fastback style roof. Journalists and buyers alike were left in awe by the gorgeous design, and its engineering too. The XK8 was the first car to be released with Jaguar’s new AJ V8, pushing a respectable 280 bhp to the rear wheels through a ZF 5-speed automatic transmission. It was bumped up to 290 in 2000 with an updated version of the 4.0L V8, and then to 294 in 2002 with an all new 4.2L unit mated to a ZF 6-speed automatic. The suspension was solid for the car, providing modest feedback through the steering column and a very soft ride for the most coveted businessman who owned them. The car could truly drive as well as it looked. The public was in awe at this new XK8, and order flew in as soon as it went on the market. It also helped that the price was modest for the car, especially in comparison with the aforementioned DB7 that was nearly $50,000 more expensive in comparison, with just as many features, riding on the same platform. The XK8 was bound to be a hit, and it only got better from there. In 1999, Jaguar introduced a supercharged variant of the XK8, the XKR, further expanding their R performance line introduced with the XJR in the 1980s. The XKR was more performance oriented from the get-go, providing more taut suspension components, bigger brakes, and a more aggressive exterior finish with hood louvers and larger wheels. Power was upgraded to the near-400 horsepower mark through use of a supercharger mounted upon the existing Jaguar V8. Early models borrowed transmissions from Mercedes-Benz, but was upgraded to the 6-speed unit along with the XK8 in 2002. From 1996 through 2005, the X100 was a solid performer in sales, with Jaguar producing around 90,000 units, on par with most other GTs at the time such as the Mercedes SL. The car did have one issue though, and that was Jaguar’s tendency to let models sit and age, and although the design was still as gorgeous as day one when it left the market, most of its components were not so lucky. However, Jaguar did have plans to revolve the life of the XK completely, and they did just that in 2007. The world’s first look at the X100's successor came in 2005, with the Ian Callum designed Jaguar Advanced Lightweight Coupe concept, debuting at the North American International Auto Show. It was clear that the newest XK would go in a slightly different direction than the X100 did, with a sleeker design forgoing the former’s muscular, wet paint-esque lines, and predicted the future of Jaguar design with a more futuristic, yet sedated look that oozed, “God Save the Queen,” at every corner. It was a hit, and Jaguar would have been stupid not to bring it to production. Lucky for us, they did. The X150, or second generation XK, was released in 2007. Both the XK (replacing the XK8) and XKR were released at the same time, providing potential customers with some slightly different choices from the beginning. It borrowed most, if not all styling cues from the 2005 ALC concept, and was an instant hit with journalists and the public everywhere. The XK found its power from the 4.2 liter V8 that its predecessor did, with power upgraded to a modest and even 300 horsepower during its first years of production. The only transmission available through the range was a 6-speed automatic, which was upgraded along with engine choice within the 2009 refresh, with a new 5.0L V8, upping power to 380, nearly matching the power levels of its predecessor’s high-performance variant. The suspension of the base XK was much like the X100's as well, tuned more for luxury, but still as responsive making it quite a thrill on long journeys, just as it was intended. 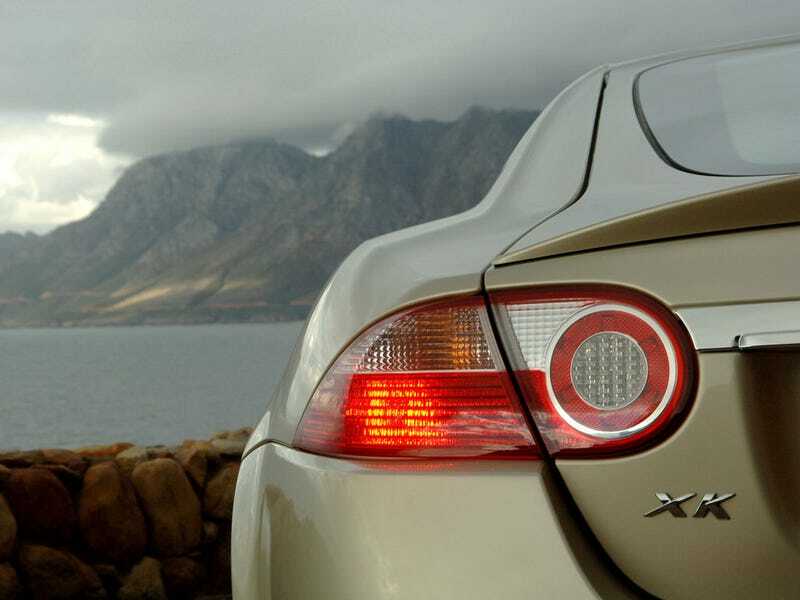 Much like the base XK, the XKR was also a logical evolution of the original’s policies, providing a much more raw look at the potential of the XK. The engine was once again a supercharged version of its base counterpart’s, with the original 4.2L unit producing 420 brake horsepower, and the 2009 and up’s supercharged 5 liter unit making 500. The suspension was tuned with more sport in mind, just as before. However, the R did not stand as the most extreme X150, as Jaguar had other ideas in mind. Following the luxury performance craze of the early 2010s, Jaguar took advantage and made a racing-inspired XKR-S for the 2011 X150 facelift. The XKR-S sported a much more raw outside appearance, sporting carbon fiber accents, functional hood vents, and aerodynamic changes. Power output was upped to 550 from the XKR’s supercharged 5 liter V8, and the suspension was firmed even more, forgoing the luxury ride for a tighter, track-oriented ride. They went even further with the harsh dynamic with the low-volume XKR-S GT, with even more suspension tuning to improve upon the regular XKR-S.
As with the original XK, the public took immediate notice of the X150, and sales were modest at first. But as new competitors such as the BMW 6 Series slowly crept into the market, the public soon turned their eyes away, and the X150's sales suffered for it. Also not helping the fact was how Jaguar left the X150 to age on dealership lots in comparison with its competitors, and by the end of its life, it had been overshadowed completely with Jaguar’s new sports car, the F-Type. The X150 sold in total approximately equally to the X100, which paled in comparison to how many 6 Series and SLs had sold in the same amount of time. In 2014, Jaguar pulled the plug on the XK after nearly 20 years in production, releasing a “Final Fifty” model to celebrate the end of the line. Jaguar has since placed focus more on the F-Type sports car, and as of 2018, no plans have been set in stone for an XK replacement. Deciding which generation of XK was the better looking one is like picking a favorite child. Both have redeeming qualities, both have their faults. It’s nearly impossible. I may find myself looking towards the X100 often, but I still wouldn’t mind an X150 either. It just proves how much thought was went into these cars and their designs, you honestly won’t find a better looking pair of generations of a car in the world. So, why do I think the car deserved better? I just feel like the world has collectively forgotten its existence, and I feel like that’s a shame. If you look upon threads about the finest luxury coupes of the 90s and 2000s, you’ll see constant comments about the BMW 8 Series and Mercedes R129, or the Aston Martin DB9 and BMW 6 Series, but you rarely see any mention of the XK. So, I just want to see the XK loved a little more than it is, especially considering they’re rather affordable in the used market nowadays. The XK was beautiful, fast, and comfortable, everything a Jaguar should be. It deserves more love, and I’m going to try my damndest to give it more love. I just hope you lot are willing to help.